Wood or silverware, those are my options for fifth wedding anniversary gifts. I didn’t like either, so I made a video for the love of my life. It’s totally sappy, sentimental, and personal; therefore I’ll do what everyone else does – make it public. If you’re not in the mood for something over the top romantic and gushy, don’t hit play. If you’re curious or bored on this in-between Christmas and New Year’s week, turn up the volume before you play it. The song makes it. The only fun he had was driving home watching Toy Story in the car. 21,000 people entered the race and I swear half of them had children in the kids’ race. On the drive into the city, Mister agreed to run with Bunder while I held Kiki and videotaped. 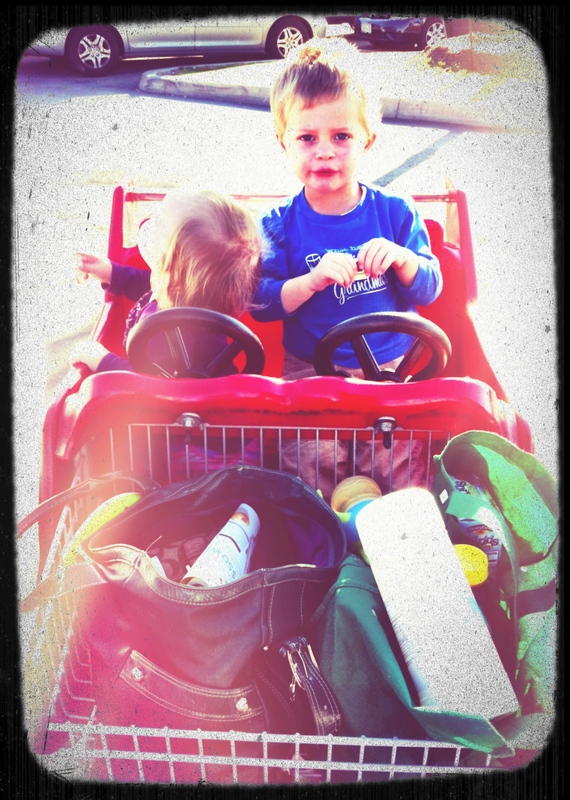 After finding a parking spot, we quickly unloaded the car and took off for the kids’ starting line. Mister and Bunder found a spot in the starting chute, while Kiki and I set up camp in between the start and finish lines. The racecourse looked like a horseshoe. From my vantage point, everything looked great. Bunder smiled at the start as he trotted past and had a determined expression as he approached the finish. I’ll let you see for yourselves. Bunder’s first ever Turkey Trot. I can’t believe it’s Thursday night! I started this post on Monday, on Halloween – where has the week gone? I know the answer: Halloween, trick or treating, Mister’s birthday including a special dinner, pumpkin pie, pumpkin eggnog, and brown butter pumpkin cupcakes (seriously, he has an obsession), and then laundry. 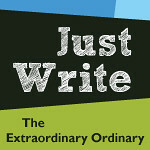 I hate to admit it – clean underwear and socks take priority over this blog, but whatever. As you read this, allow yourself to time travel to the past (three days into the past to be exact). It’s Halloween and I just experienced the scariest event in my life! And let me tell you, I’ve toured my fair share of haunted houses. I’ve traveled plenty of ghost-filled hayrides. I’ve been lost in a corn maze in the country at night (talk about dark). I’ve even been buried alive (albeit by plastic balls, but still in the shadows, in a haunted house, it’s pretty terrifying). 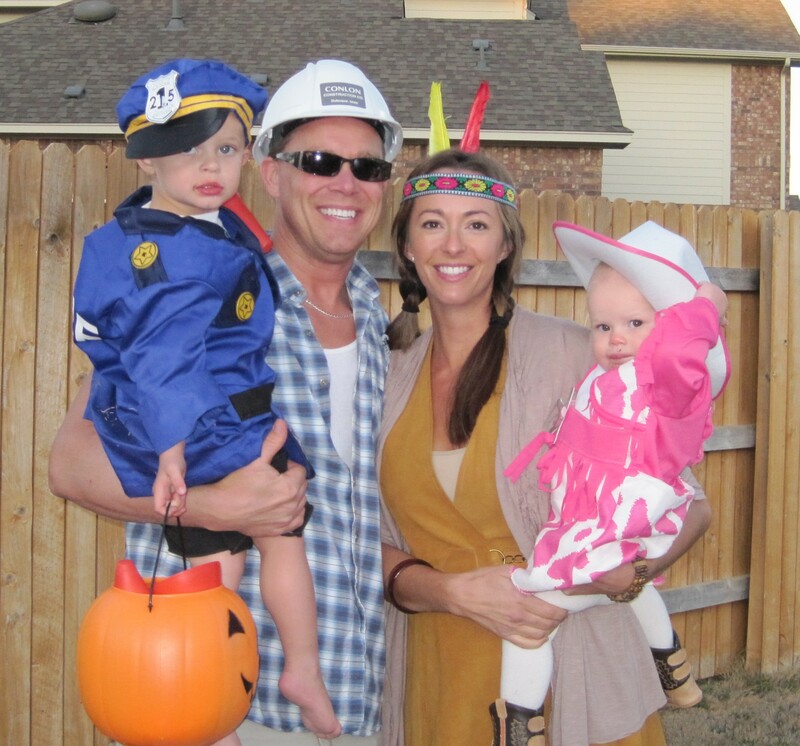 Stay at home moms with toddlers attending a FREE Halloween event. 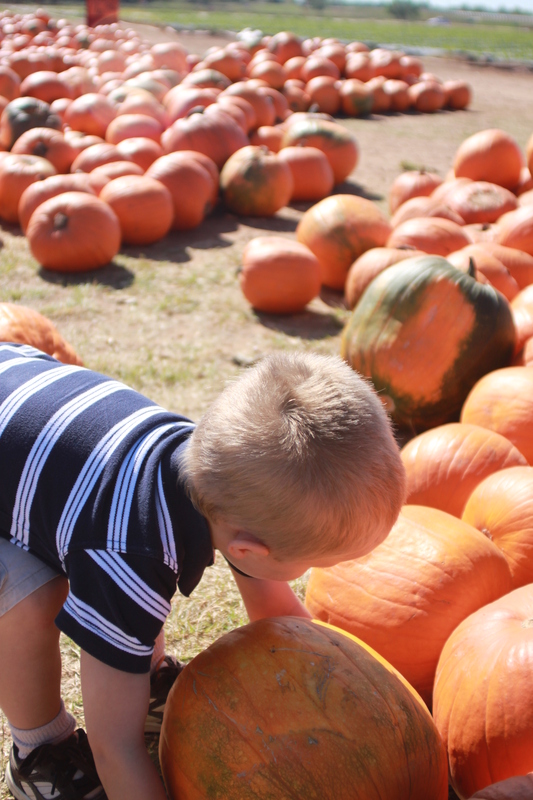 In a community close to us, the Parks and Recreation department hosts a FREE Fall Festival for toddlers. I attended last year, and had three meltdowns in the crowd of hundreds of moms and toddlers (not to mention Bunder’s numerous tantrums- he was 18 months at the time and had a new baby sister – he had a lot to cry about). I knew this year I was going balls to the wall (this is an aviation term – I Googled it) or I wasn’t going at all. Therefore, I strapped poor Kiki in her car seat at naptime (8:15 a.m.) and drove slowly to allow a short nap before the 9 a.m. start. At 8:55 a.m., I turned off the highway into the park feeling mellow and accomplished with Kiki asleep, lullabies playing, and Bunder content. Suddenly, I noticed all around me, surrounding our car were minivans -not just any minivans, but minivans with moms on a mission. The road we drove on had four lanes across. What – why four lanes on a road into a park? I don’t remember this from last year – wait – uh-oh – the four lanes are becoming two. Which lane is ending? Do I slow down? Do I change lanes? I can’t – I’M SORROUNDED BY MINIVANS! Oh, good! It’s the other lane that’s ending – not mine. All I have to do is hold on tight – no, I can’t let you in – don’t you see the mad-mom minivan behind me? She’ll surely rear-end me if I let you in this lane! I followed the flagmen directing me to a spot in a field and couldn’t help but gawk at an angry flagman storming up to a mad-mom minivan who obviously didn’t follow his directions. Wow! At that point, I realized, this is no ordinary Halloween event. 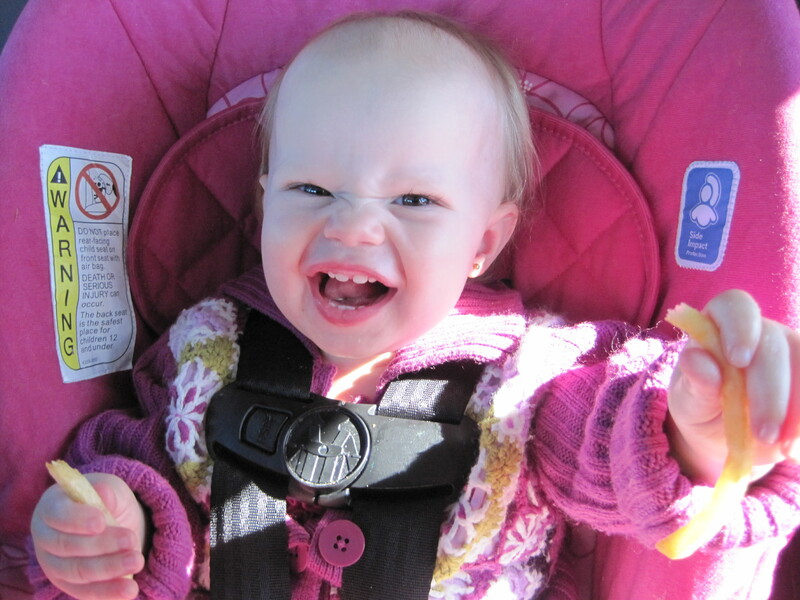 Anxiously, I watched one of the flagmen direct a minivan to park directly behind me and hoped that mad-mom minivan would allow enough room for me to unload the double stroller from the trunk. Without a second to lose, I jumped out of the car and was startled by the music blaring in the minivan next to me. Way to rock out at nine in the morning with a vanload of kids! Now the real race began! Everywhere I looked moms were dashing out of their minivans, unloading strollers or wagons, strapping kids into them, grabbing their diaper bags and coats and sprinting (as well as one can sprint when pushing a double stroller with multiple children) to the entrance line. By the time I crossed the field (a.k.a. temporary parking lot), the line moved steadily. I picked up Bunder and Kiki’s treat bags, which included a book (is the $2 book worth the mad-mom minivan dash?) and surveyed the area. Lines formed quickly for the games nearest the entrance, but as far as I could see, no one was in line for neither the hayride nor the games on the far end. Bunder enjoyed a few games, collected candy, scarfed down a cookie and an orange drink (only after spilling some on my dry-clean only coat. What was I thinking wearing a dry-clean only coat. I guess, I was so excited to wear a coat, I grabbed my favorite one). Kiki played with her free balloon and ate the candy Bunder won. 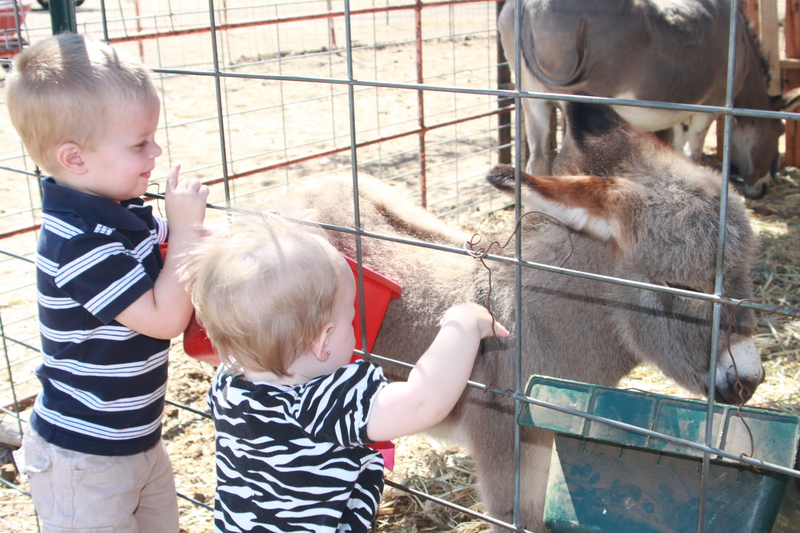 The three of us rode the short hayride, petted the police dog, and played at the playground. I visited with a few moms from my mom’s group, and we left by 10:15 – just as moms and children flocked to the park. Whew! We made it! What a great success and a big THANK YOU to the Round Rock Parks and Recreation for such a fabulous, fun event! Next year, I’m borrowing a minivan. I awoke this morning to the pumpkin patch calling my name. “What is that like?” you ask. 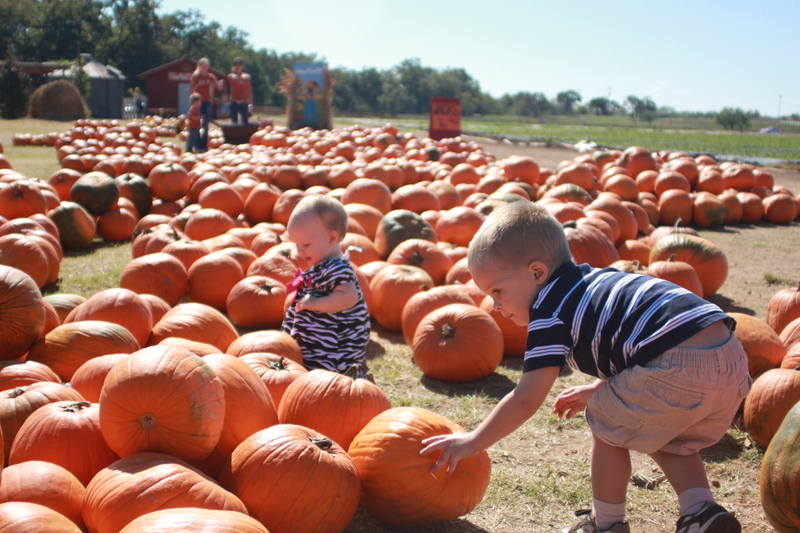 When the pumpkin patch calls my name? 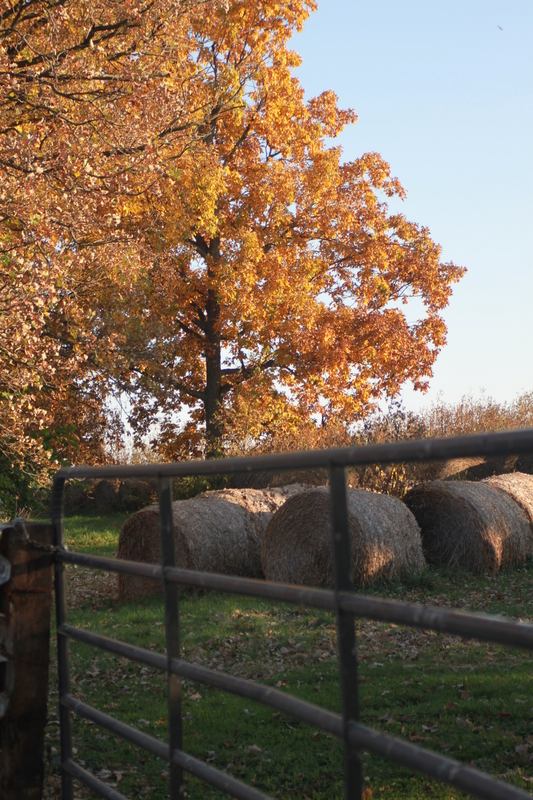 Is it some sort of deep, emotional longing for crisp, cool, autumn days spent on the farm amongst the smell of cut hay and drying corn? Not exactly. 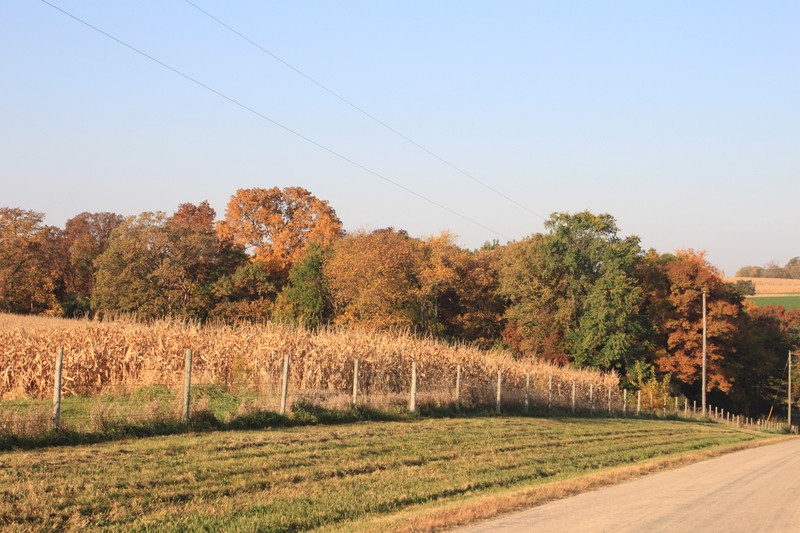 Though, I do miss the vibrant colors of the leaves, the golden corn, and the green grass of the Midwest. 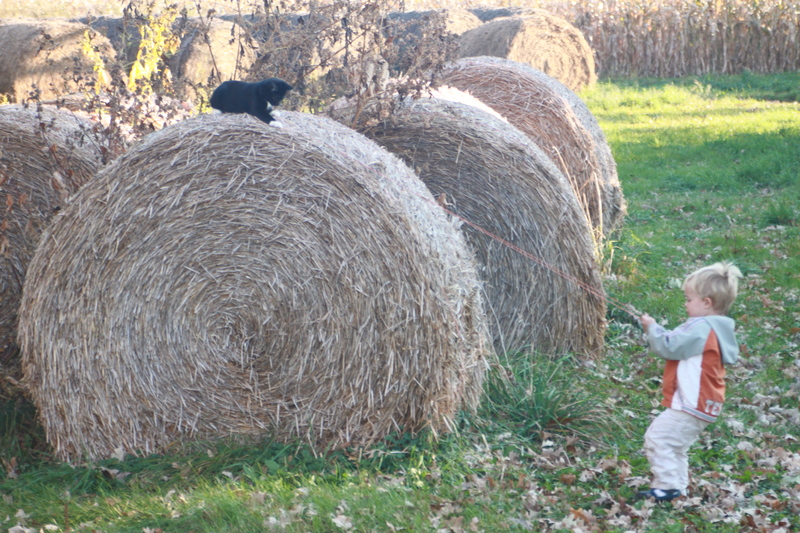 Is it fond childhood memories of climbing hay bales in the field and running through rustling leaves, while chasing a kitten? Not quite. 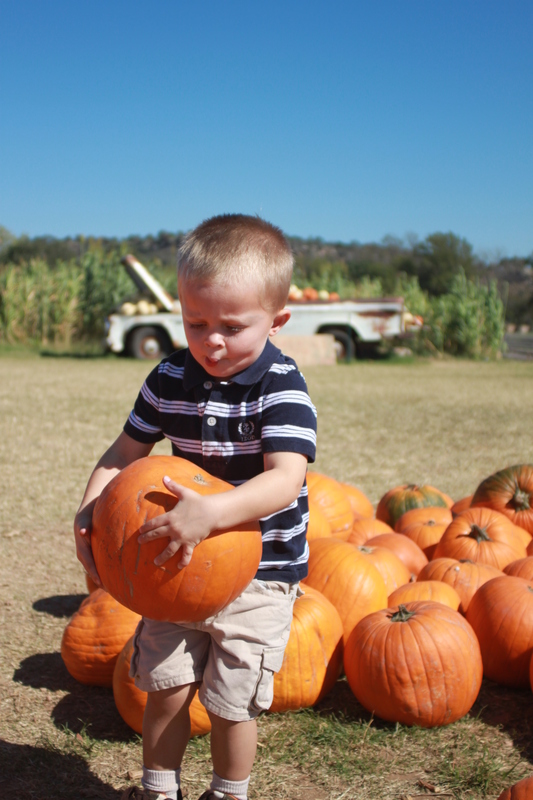 Nonetheless, I did enjoy watching Bunder do those very things while visiting the farm in October. 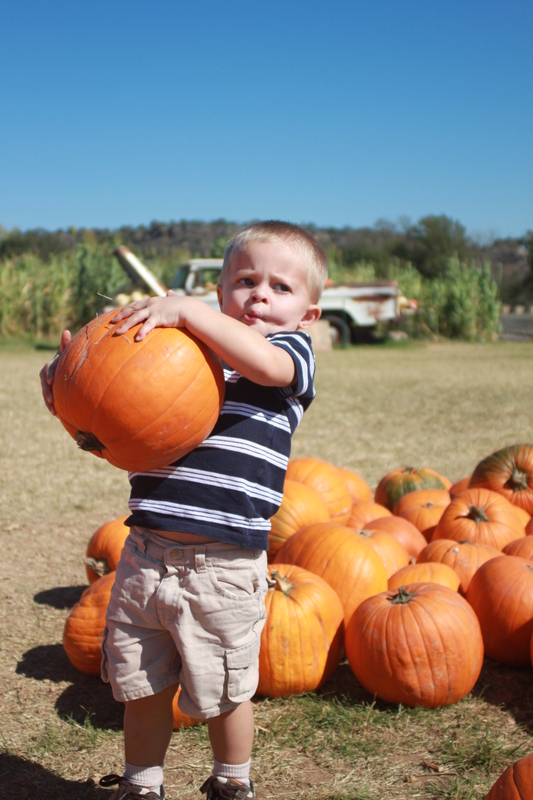 I have no idea where he got the whole – eating pumpkins thing. I guess adventures are more fun with food. Bunder wasted no time. He started work immediately. 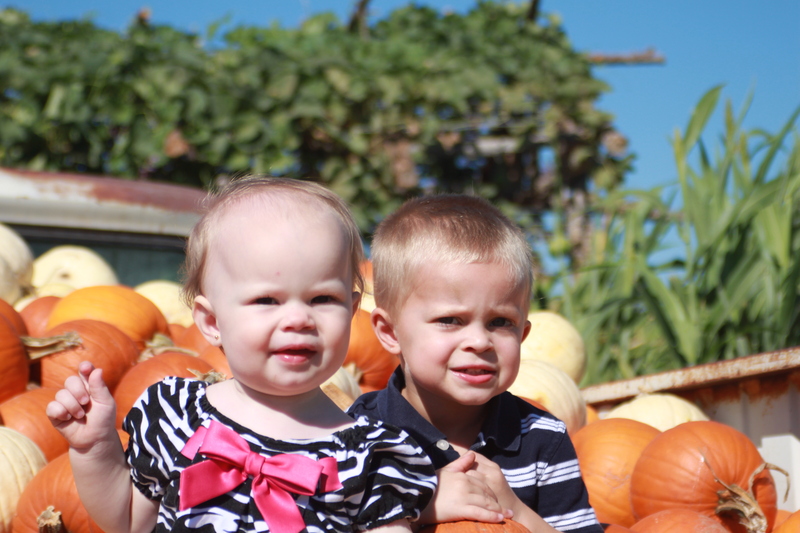 Don’t you know picking up pumpkins, carrying them, dropping them near your sister, and scaring your mom are very important jobs! Notice the fish lips. He’s in deep concentration. I’m telling you it’s hard work! I know you’re all thinking – what kind of fall outfits are these? Well, it’s tricky to find fall clothing suitable for 76 degree weather. Don’t get me wrong, I’m not complaining! It was a gorgeous day. 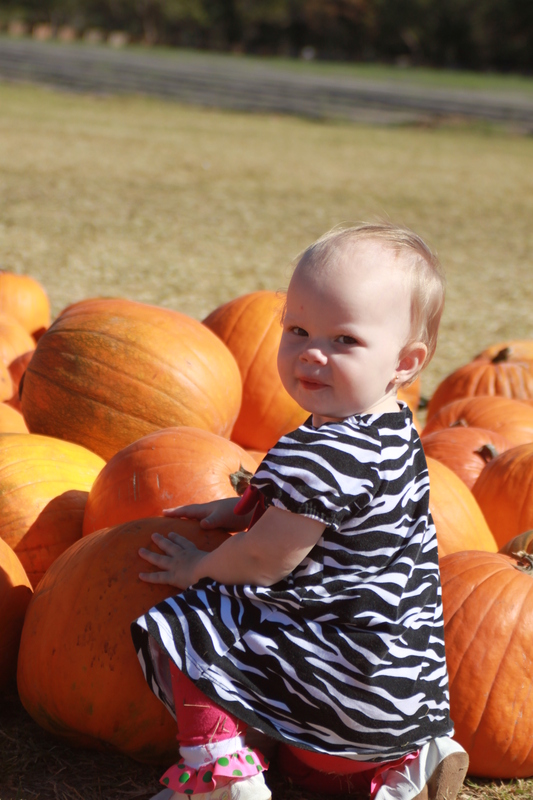 Kiki’s sophiscated over-the-shoulder pumpkin pose. That’s right, Bunder! 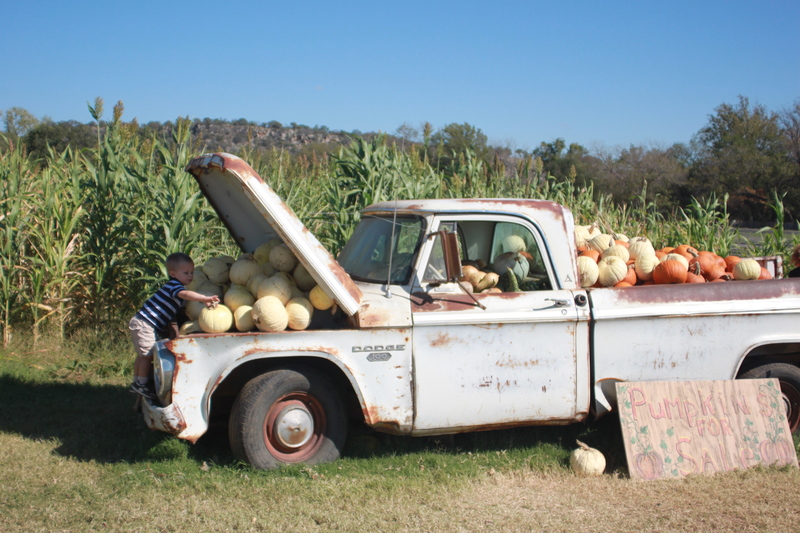 You have a whole truck of pumpkins to unload. 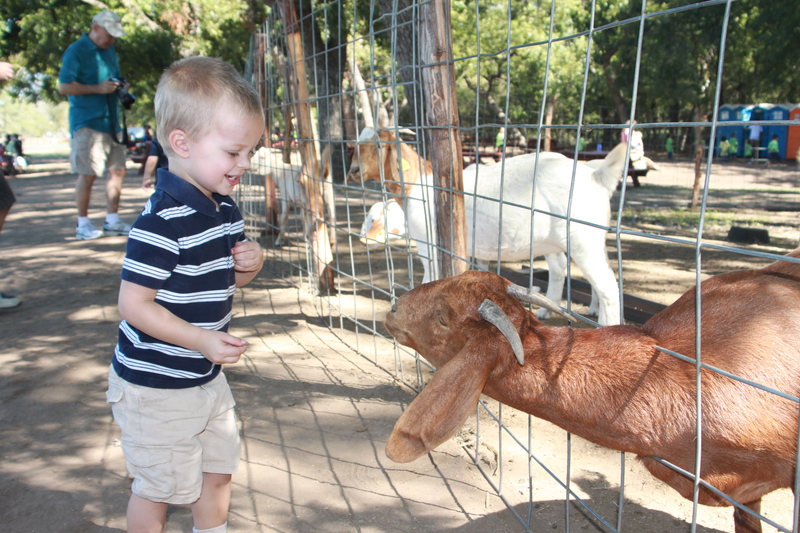 I like goats and all, but SERIOUSLY what’s with the overabundance of goats in Texas? 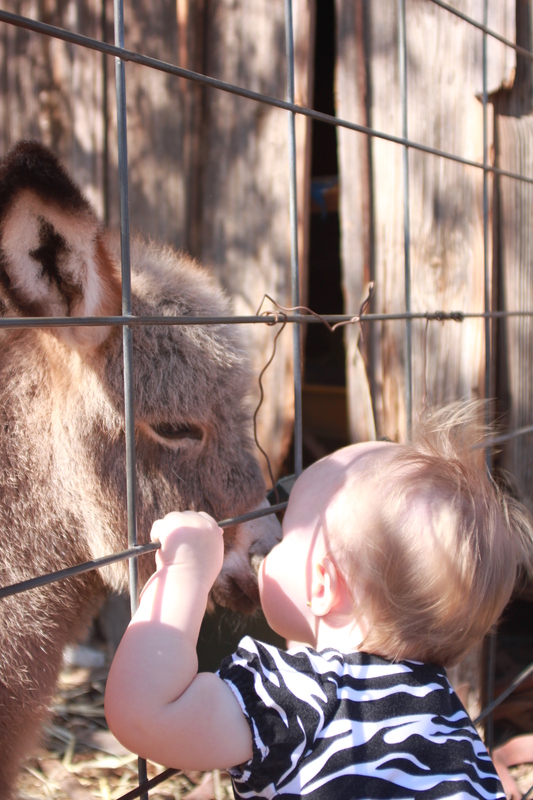 Of course, no pumpkin patch would be complete without a 16-day-old baby donkey. 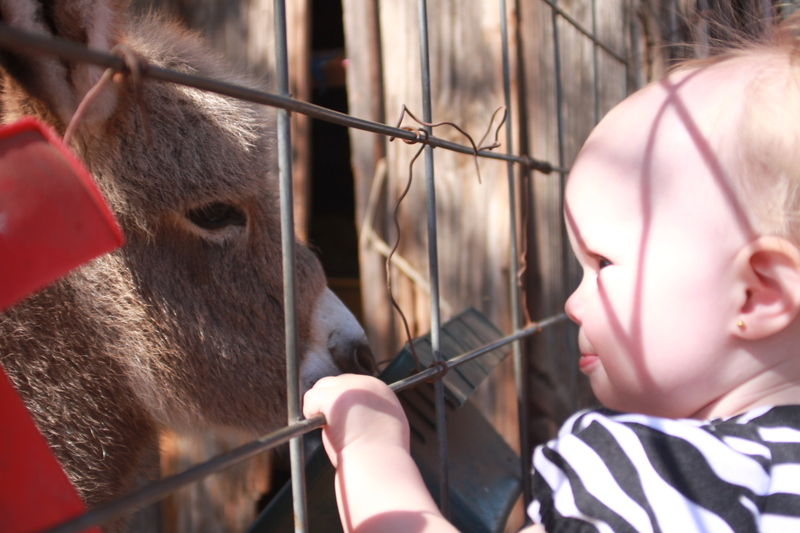 It’s hard to see, but that’s Kiki licking the baby donkey’s nose. She just loves to give open-mouth kisses. What’s the point of being a stay-at-home mom if once in awhile I can’t blow an entire day with a fun outing like this? Maybe next time, I’ll figure out how I can use the bathroom.